On this date in 1868,* eleven samurai committed seppuku before the French consul in Japan spared their nine comrades. The affair was stunning punishment for what’s known as the Sakai Incident — an offense eight days prior that occurred during Japan’s Boshin War, a last rearguard battle of loyalists to the (now officially ended) Tokugawa Shogunate against the rising imperial party of the Meiji Restoration. What’s noteworthy for our purposes in this period is that the Meiji espoused an anti-foreigner policy — one that was not the less intently felt by the Meiji base for being entirely insincere on the part of elites. It was in this tense context that a boat full of French sailors from the corvette Dupleix called on March 8 at Sakai — a port city whose shogunate forces had routed. It had been recently occupied by imperial troops. Japan had only been opened to the west 15 years before, and access was still quite restricted; there might have been a misunderstanding between the French sailors and Sakai’s Tosa clan occupiers over whether this city was open at all. There was definitely a misunderstanding once the tourists ran into samurai on shore, and before you know it high words and suspicious glares turned into a street skirmish that left eleven Frenchmen dead. This Sakai Incident (English Wikipedia entry | French) incensed western powers, and not only the French: the British, Dutch, Prussians, Italians, and Americans all pulled down their embassy colors in solidarity pending adequate satisfaction for the French. 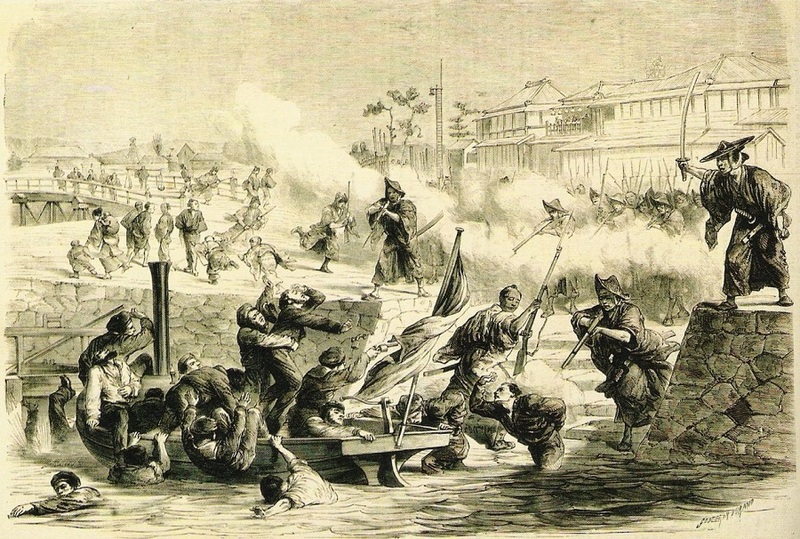 Japan at this moment was not at all in a position to take a stand against foreign gunships over this dust-up, and it met the conditions — which consisted of some personal groveling by a state minister, the payment of a 150,000-piastres indemnity, and the execution of the officers and soldiers involed. The punishment would be self-administered by seppuku at a Sakai shrine. This set the scene for a powerful climax, in which the soldiers one by one tore out their own guts in a ceremony that must have played as defiance no less than submission. Quoting the Moniteur, the London Morning Post of May 19, 1868 (news was slow in those days) describes the operatic punishment. On the 15th [a Japanese] high functionary brought a written reply from his Government conceding all the satisfaction required. On the following day Captain du Petit-Thouars, commander of the Dupleix, landed at Sakai to witness the execution of two officers, a subaltern, and 17 Japanese soldiers, condemned to death as the principal authors of the aggression. The two chiefs were the first put to death, after which nine others perished successively. Captain du Petit-Thouars then seeing that the Japanese Government was decided on carrying out its engagements to the end, and ceding to a feeling of humanity, stayed the execution, declaring that he considered the reparation sufficient, and that he proposed to ask the Minister of France to intercede for a commutation of punishment in favour of the other condemned. The last nine beneficiaries of the captain’s clemency were sent into internal exile instead. * There are some citations that give the date as the 23rd. The original reporting I have located unambiguously asserts that the execution occurred on the 16th.